And no, I don’t mean the types that work at IFC. I mean the sweet, almond-buttery French teacakes that are so versatile and so easy to bake that I almost feel like I’m tricking people when I make them. I’ve read that they were first made in the late 19th century by a pastry chef whose shop was close to the Paris Stock Exchange, and originally financiers were baked in rectangular molds that were said to resemble bars of gold, hence the name. 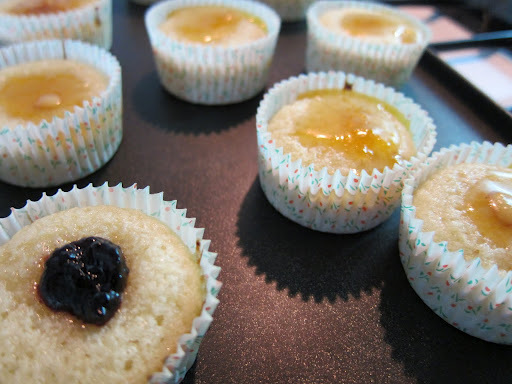 Now, I wouldn’t say that I’ve mastered the financier quite yet, I still detect a lingering egg white aftertaste in mine, but that is why I have to make them over and over again – practice makes perfect! 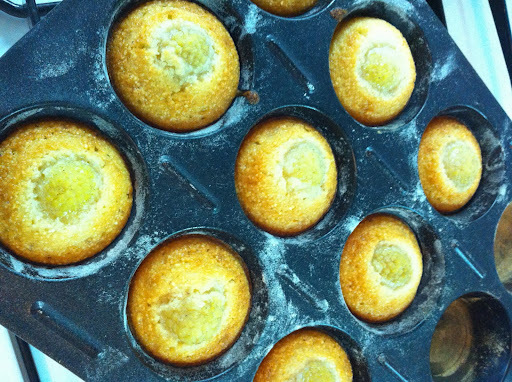 The secret to a good financier must be the beurre noisette, and the quality of the butter that you use to make it. I must admit, I haven’t made it before and I always go the lazy way by melting butter and then using it once it cools down. One thing I do know is that President brand unsalted butter is one to be avoided! When cold, it’s dry, crumbly and lacks any sort of creaminess that you would expect from butter. When melted, it smells faintly of vomit – no kidding. To make the beurre noisette (literally translated as ‘hazelnut butter), place good quality unsalted butter in a small saucepan over medium heat. Once the butter has melted let it come to a boil, swirling the pan occasionally. As it boils, a foam will appear at the surface. Continue to cook the butter until it looks clear and the milk solids have dropped to the bottom on the pan and are a deep brown colour. Remove from heat and immediately pour through a cheesecloth-lined strainer and let cool. This separating and heating gives the butter a nutty flavour. Ok, that is as technical as I’m going to get, and as I said, if you want to be lazy (like me), you can use melted butter. The result still tastes great and will only take you 15 minutes to prepare and 15 minutes to bake. 2. Put butter in the microwave for 20-30 seconds, taking it out once to stir. 8. Add egg whites, cooled butter, and use a spatula to fold the mixture together untilcompletely incorporated. in each), bake at 205C for 12-15 mins. Now this is where you can personalise your financiers! 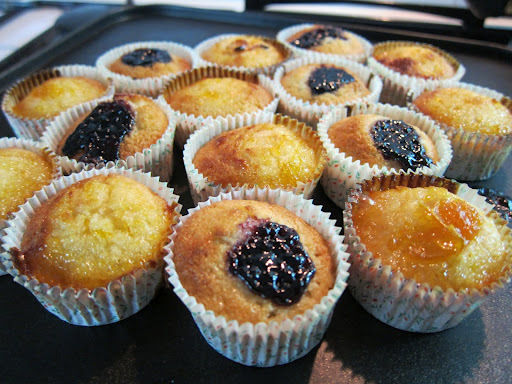 I’ve used muffin tins (2 tbsp per mould) and topped them with red raspberries (these look better with the contrast in colour), and golden raspberries. I’ll also be experimenting with different berry toppings, adding chopped pistachios, or a few tablespoons of cocoa powder to make chocolate financiers, YUM! Tip: If adding toppings, bake the financiers for 4 mins, then remove from the oven and add your toppings – this way they’ll look prettier 🙂 and won’t sink to the bottom. Then bake for a further 7-10 mins, depending on your oven. You know when they’re ready when they look golden brown and crispy on the top. Try them out, you won’t be disappointed. Trust me, one recipe won’t last long! These are awesome, you should make them at home again. Gotta try them with the jam.